The Sky Patio in Watertown comes in both 3- and 4-bedroom variants. 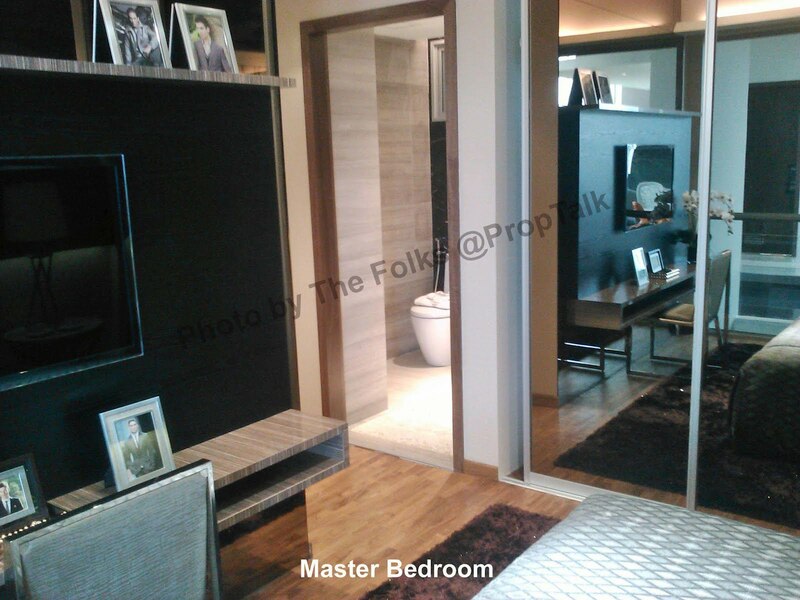 The showflat features the 1,173sqft, 3-bedder unit (Type C1b). As you walk through the main door, you arrive into the living/dining area. 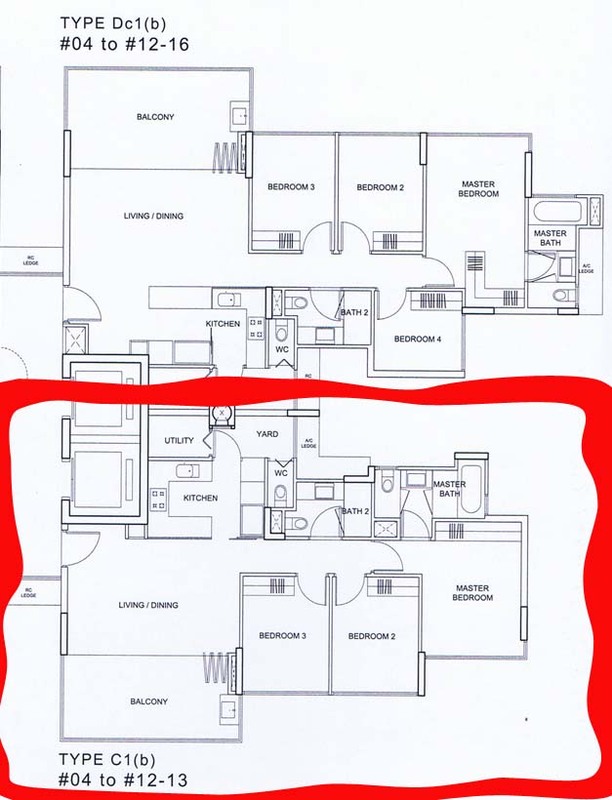 We like the fact that unlike most 3-bedders that we have seen recently, there is no long walkway (aka "dead" space). 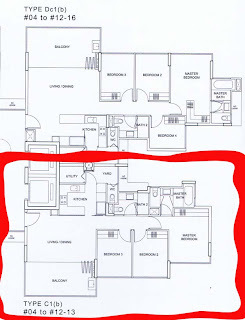 The living/dining area is rectangular shaped and seems rather spacious for an unit of less than 1,200sqft, even with decent-sized furnitures. It comes with 60cm x 30cm marble-slab floors (a pleasant surprise compared to the homogenous tile that is the norm these days) and 3-metre ceiling! The kitchen is self-contained and very good-sized. 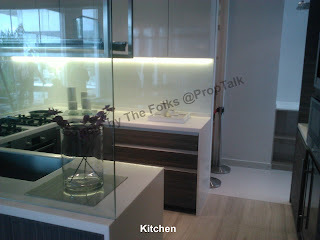 The developers have gotten it right by dispensing with a "dry kitchen" area, as the apartment can ill-afford the space. And as per many of the recent Far East "involved" projects, the developers have thrown in a whole host of kitchen appliances other than the usual hob/hood/oven/fridge. You also get a microwave, wine fridge and even a dish-drying rack that's mounted above the sink! The utility room is in the yard area behind the kitchen. It is decent enough size but we suspect you will need to customize the bed for your domestic helper. The yard space is longish and very functional. 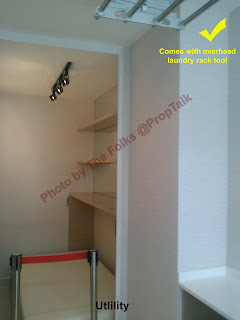 And unlike many of the showflats that we have seen recently, you do not have to worry about where to dry your clothes. A mechanical clothes-dryer is provided, while a huge window provdes ample natural ventilation and light into the yard area. And to top it all off, there is even an extra sink in the yard for your "hand-wash" items... nice! 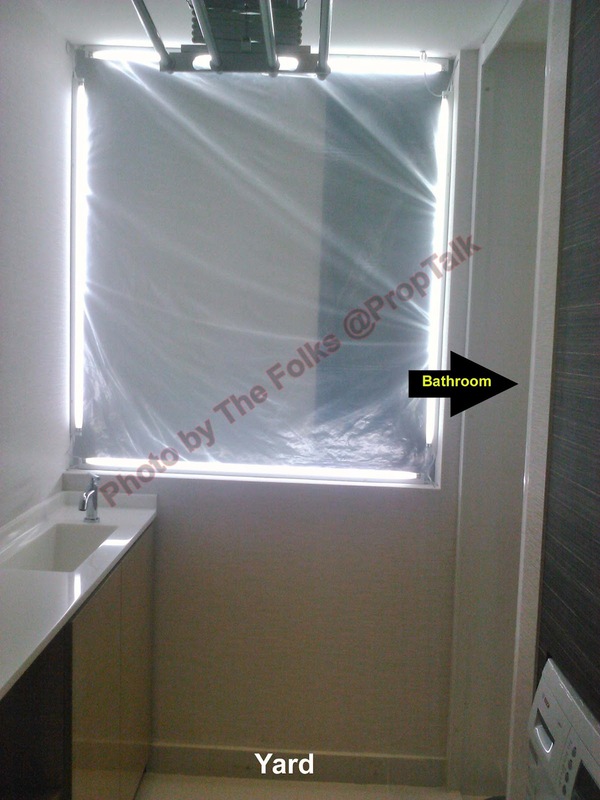 The common bathroom is good-sized and you get marble floors/walls (we had to double-checked on this with the marketing agent, as the "marble" slabs sounded rather hallow when we knocked on it). 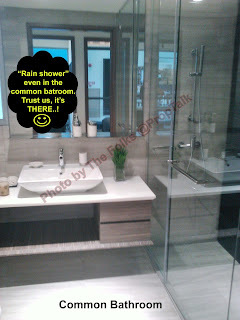 And also "rain shower" in the shower stall - a luxury not commonly found in many other projects nowadays! The common bedroom is surprisingly good-sized, especially considering the size of the unit. It can probably accommodate a single bed and a small writing desk, if you place the bed against the window. This is more than you can ask of bedrooms in many other projects that we have recently seen, whereby you have hardly any walking space left after putting in the bed. However, the wife will tell you that it is quite bad "Feng Shui" to position the bed as per the showflat (see photo). This is because your bed "cuts" the door, which will create bad "chi" within the room resulting in unrestful sleep. The master bedroom is again rather spacious, even with a King-sized bed. It comes with nice timber-strip floors (common for all bedrooms) and standard two-panel wardrobes. 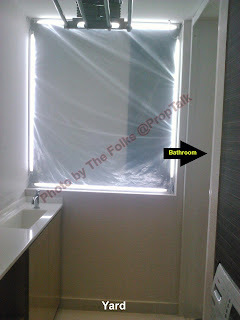 The wife and I are not really for glass "doors" - although it makes the bedroom looks bigger and also functions as a mirror, you need to get rid of all the "finger prints" diligently else the glass panels will always look "dirty". The master bathroom is again decent-sized and the "dark constrast with light" color scheme for the marble floors and walls is quite aesthetically pleasing. 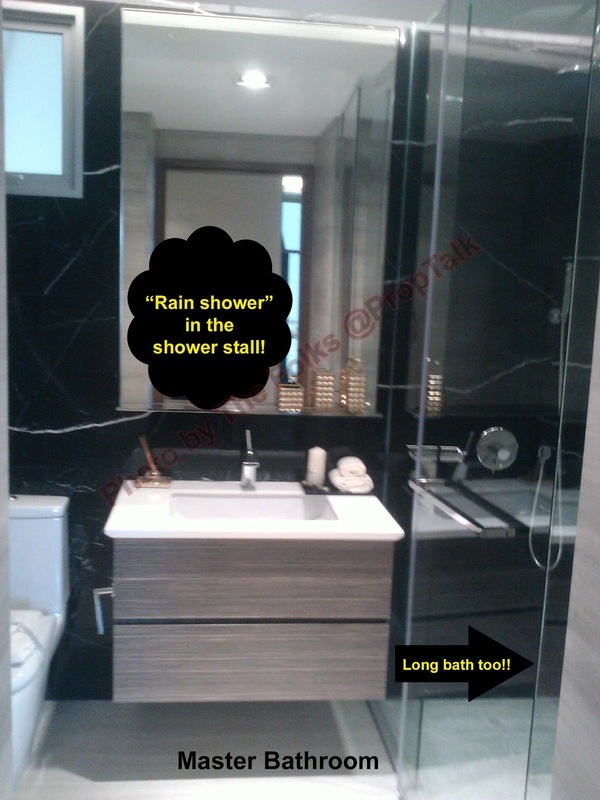 It comes wth a long bath AND an adjacent shower stall, a feature that is normally reserved for 4-bedroom apartments. Now for the "exciting" bit - Price: The wife and I were told that the Sky Patio apartments are considered "premium" units and as such, they also come with premium prices. So after all applicable discounts, the nett price for the unit comes to $1,591,436 or $1,356psf. • Convenience - No argument here, given the huge shopping mall beneath your block, integrated access to Punggol MRT/LRT stations and the added appeal of waterfront living along the Punggol Waterway. Watertown is practically self-contained as all the amenities that you need (including going to the movies) are available at your doorstep. So there is really little need to go down to Orchard to shop/eat or catch a movie, unless you really want a change of surrounding. • Layout and Design - The wife and I have not seen a better layout and design for a 3-bedroom apartment for quite some time. Matter of fact, we cannot recall another 3-bedder showflat that we liked more than the one we saw at WaterTown. The apartment layout is very well thought-out, while all the different living areas (balcony and yard included) are designed so as to maximize space and practicality. • Quality Finishing - The developers certainly pulled out all stops in this department - from the marble floors and walls right down to "extravagant" like the wine fridge, dish-drying rack, laundry system and "rain showers" (for both bathrooms, no less!). • High Ceiling - The 3-metre high ceiling gives the apartment alot more "volume", which probably explains why the 1,175sqft 3-bedder felt so much bigger than its actual size. You also will have no problem installing that ceiling fan or chandelier, even with false ceiling! • Location - No matter how you try to justify it, Punggol is... to most of us not living in the Punggol/Sengkang area... FAR (although one will say that this is subjective). Despite the convenience of MRT and supposed good connections to the various expressways, it is still a fairly long way to get from Punggol to the city and other parts of Singapore. So those living in WaterTown may really have to revolve their lives around the development and facilities nearby... out of consolation rather than desire. 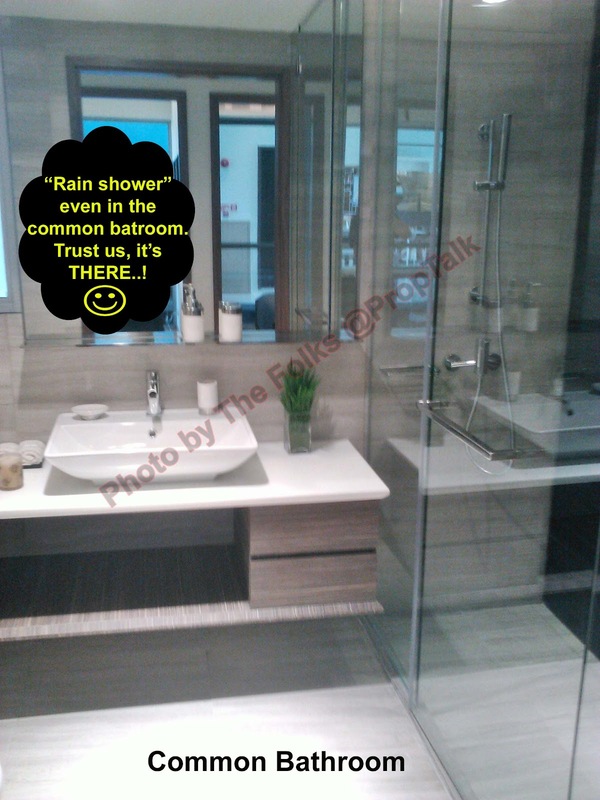 • Exclusiveness - Call us paranoids if you must but the wife and I do question about the "exclusivity" factor in mixed-developments. We do understand that there are segregated entry/exit points for residents and the general public visiting the mall. We also believe that the condo management will deploy enough security guards to ensure that the condo grounds are well patrolled. However, there is always this nagging feeling that with mix-developments, one will find more cases of "non residents" wandering around or even using the condo facilities without permission. • Traffic - The Watertown Mall is supposedly located at the town centre and is slated to be the largest (if not only) mall in Punggol. Looking at the many public housing surrounding Watertown and with more BTO flats, ECs (Prive, Twin Waterfalls) and private condos (A Treasure Trove) being built around the area, we suspect traffic along Punggol Walk and Punggol Central is going to increase many folds over the next few years (even on weekends), which may be a bane for Watertown residents who drive. • PRICE - It is a Far East project, albeit a joint-venture, so the wife and I were prepared to be "wowed" by the price. However, we still went away amazed. When we "complained" to the marketing agent that prices for Far East projects are "famous" for being the highest in the market, he was quick to point out that Watertown is not totally a Far East project as it is developed by three parties. We told him that if Watertown is "exclusively" Far East, the selling price will probably be $1,900psf! 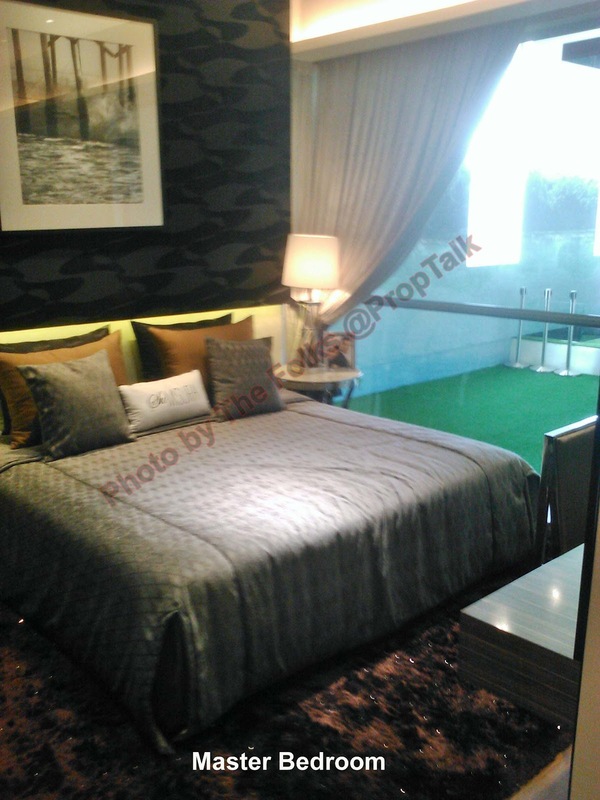 • We probably can find a $1,300psf, 3-bedder alternative (ok, maybe not brand new) that's of similar size, full facility, located fairly near to shopping malls/MRT station and much nearer to town. • Owners of nearby public flats and private condos (including A Treasure Trove, which was sold at less than $900psf during its launch) are rubbing their hands with glee waiting for the completion of Watertown, as they can almost see the resale prices of their apartments soaring. Huat ah! 8 comments to ''Watertown (Review) - Part 2"
First of all I would like to thank you and your wife for all the valuable informations and all the detailed properties reviews written in your blog. It sure given a home hunter like me a lot of insight while looking for a home to buy. Now, just to bring to light that not all the Watertown condo are so #@$! expensive, :) Especially buyers that managed to book it during the 1st day got it for below $1000 psf! 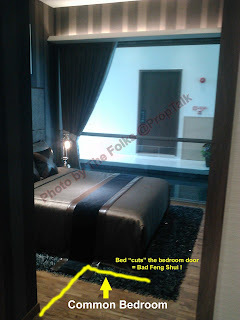 For eg, the price of #05-82 (1216 sq ft 3-Bedder) after all the applicable discounts was sold at $1,209,833 or $944.9 psf. #06-81 (1356 sq ft 4-Bedder) was sold at a nett price of $1,348,407 or $944.4 psf. Of course after the initial released units were snapped up so fast, it's typical of all developers to increase price. So by the time of your visit, price has already been rocketed to above $1300 psf level. Many thanks for the kind words and also the info provided. 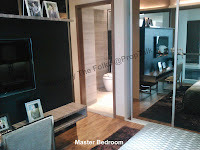 It is good to learn that buyers on the 1st day managed to get their units at below $1,000psf. The wife and I might be somewhat prejudiced here but even at $950psf, the price is already rather high for a project in Punggol, much less $1300psf! The $1000psf "new norm" price is here, whether we agree or not, the recent mass market condos are already selling at this price. 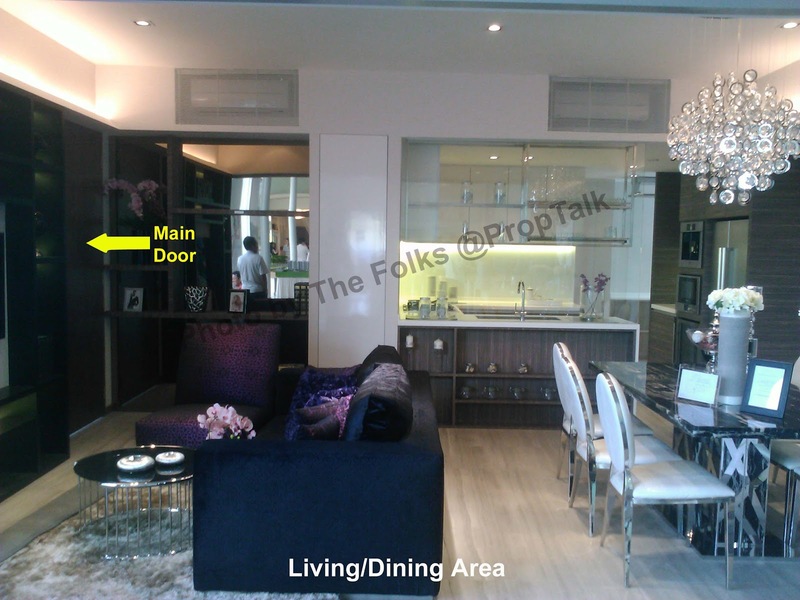 If you think $1300psf is expensive, wait for the Condo in Bishan by Capital Land. It's reported to be priced at $1450 psf for the low level units! With 2 blocks towering 34 storey, the high floor units could be touching $1700psf! This may well be the highest mass market condo price in history. Let's wait and see how the market response. Cheers and have a good day! Bishan residents...happy. Wonder if will filter to Bishan HDB prices. Although anything can happen (technically) within the next 3 -5 years but Bishan versus Punggol? Seriously?! It's akin to comparing Pasir Ris with East Coast (no offence to home owners in either area). 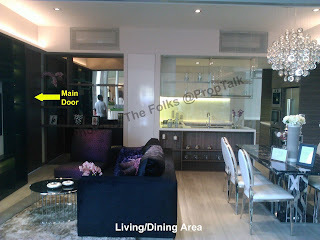 Perhaps enlighten us, what shd be the new psf norm for mass market condo projects in yr opinion? $500-600psf? When gold price was only US$300/ounce for decade, no one thought it wld one day hit US$1900/ounce! When oil price was only US$30/barrel just some years back, no one thought it wld one day hit US$100/barrel! There have been numerous recessions in Singapore over the last 30 years... But, where do our property prices still go? Up or down? A friend of mine bought a shophouse 20 years ago for just $300k, been thru all the recessions, 1997 financial crisis, SARS & whatnots, now his shophouse is worth millions.. Of coz, one can say they'll buy during the recessions, but history has proven, property transactions or volume are almost dead during a downturn- most just don't dare to buy..
guys, i think the folks are thinking from the point of view of a typical singaporean young couple. In my definition, a typical singaporean young couple between 25-40 probably have worked for ard 5-15 years, and are currently staying in their own house, and probably saved enough to invest in 1 (or in the maximum 2) properties. And truthfully i like their style of conservative investing, and i believe this is axiom is also something that they hold by closely in their heart. So what is conservative investing? In my personal definition, it means not overcommitting to property purchases by ensuring that they have sufficient income, cash flow that can help them to tide over a bad situation. To go back to the example of your friend who bought a shophouse 20 years ago for 300k, i believe he has managed to keep the shophouse for so long due to prudent and well managed financial planning. The same goes for all of us here reading SG Proptalk. 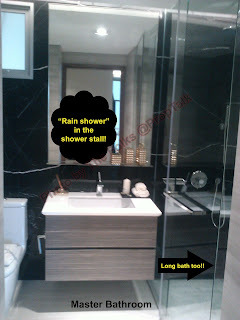 If you have the excess cash, and have worked out sufficient cash flow to go and purchase units at Watertown, D'leedon, the sail, or even sentosa cove and hang on to them even when situation turns bad, then by all means please go ahead and purchase that property. The issue lies in that there are more and more people who think of property as a fail safe investment class and this is where they are wrong. there is a good example of a young singaporean man from another property forum who was pleading for help and advise on his property at Hillview area. He purchased a low floor unit at a 'high price' back in 2007-2008 despite many people advising him against it back then. When the situation turns bleak due to 2009 Lehman crisis, he was so frightened by the burden of negative equity and faced a looming paper loss of close to 100k (a huge amount for that young man). Luckily for him, property market picked up to the current situation. As i read on I believed that the young man would have learnt from his lesson, and probably sold the unit at a handsome profit recently.. However instead of the above that young man now believes so strongly that there is no way property in Hillview area can decrease in value. Recently he even loaded up in a further 2 properties by convincing his relatives (uncle, aunties) to lend him money as downpayment for the projects.